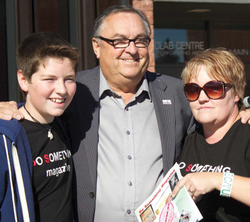 Do Something Magazine held its launch party on Saturday, October 4th, at 1:30pm at Leduc Composite High School. The afternoon was filled with entertainment and the first issue of the magazine was made available to the public along with the entire staff. The magazine is available for free, to students attending schools in the Leduc area from Warburg to New Sarepta, including Beaumont and Leduc schools. The concept started with a discussion with Angela Pauls and her daughter, and from that discussion it grew from an idea to the physical magazine. Along the way a number of individuals, organizations and business came onboard to help make the magazine a reality. The Launch Party began with Mayor Greg Krischke giving a blessing, and then the cutting of a ribbon followed by the launching of balloons. Those in attendance were then entertained by some of the best young performers from Central Alberta. Megan Kierstead from Edmonton started off the entertainment. This young performer is well on her way to making her mark in country music and set the tone for the afternoon. Garet Wood and his band, a local group from Leduc called Galaxxies, a 15-year-old singer from Elk Point by the name of Olivia Rose Leaf followed, and the closing act was eighteen year old, Kayla Patrick from Edmonton. There were opportunities to see young pit bulls from ‘Pitbulls for Life’, P.A.W.S. had a dog from Adopt a Pet, and the Edmonton International Raceway had their top driver and his car. The RCMP had representatives along with Rise Up House and Councilman Glen Finstad joining Mayor Krischke to extend the City’s congratulations. The first issue’s theme was bullying and includes many articles, of a personal nature, about the effects of bullying and what can be done about it. The magazine also has articles about young up-and-coming Alberta performers, and various charities that one can become involved with. This follows the theme of the magazine to Do Something! As a non-profit magazine, Do Something is always on the lookout for new contributors and sponsors. Anyone interested in assisting the magazine can contact them at: dosomethingmagazine@gmail.com. See more photos from the launch in this week’s paper. Toxic And E-Waste, Be Gone!